History: Tiny was the runt of the litter (and yes, Tiny is tiny – she weighs 47 pounds). Tiny’s dam is Bob’s Priss and her sire is Turbo Penske. 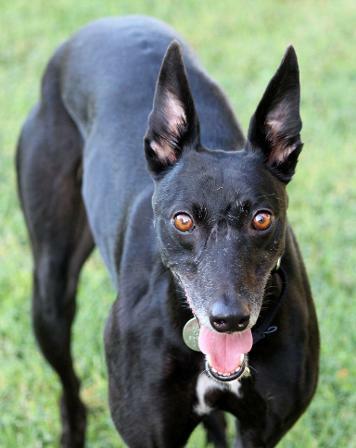 She’s a beautiful petite black girl with a sleek, shiny coat. When she was approximately 10 weeks old she was severely bitten by an adult dog. Tiny’s wounds were surgically repaired and her owners nursed her back to health. As a result of this unfortunate accident, Tiny was not tattooed because her owners knew she would not be a racing Greyhound. The owners kept her as a pet and named her Tiny. Tiny was raised in a home with small dogs and a young child. She has also been around cats. Unfortunately, Tiny’s owners did not keep her on heart worm preventive consistently and she developed heart worms. Heart worms are fatal if not treated; however, dogs can live long, happy lives after successful treatment. Tiny’s heart worm treatment will be done in three stages. (In fact, her treatment has already begun.) Some of the medical procedures are very hard on a dog’s body and she will need to be kept very quiet during treatment. She is in a loving foster home with only one small dog in an environment where she can be leash walked and live a calm, quiet life while she is going through treatment. 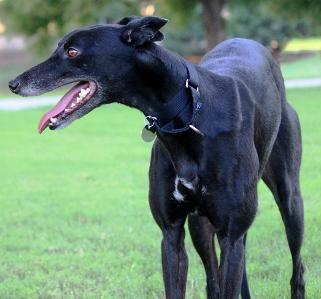 TAGS is glad it is in a position to continue its mission to find a loving, lifetime home for this Greyhound and to be able to help one with such extraordinary medical needs. As you might imagine, her treatment and continued care until her test is heart-worm-negative will be expensive. Please help TAGS help this tiny little girl. Tiny will benefit from your generosity. 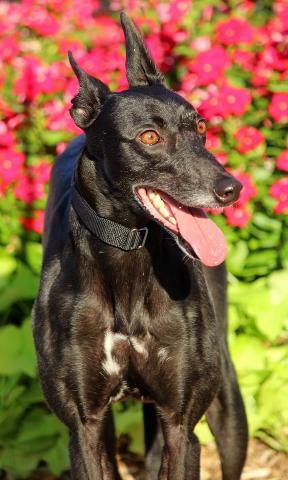 Tiny is not individually registered on Greyhound-Data.com. 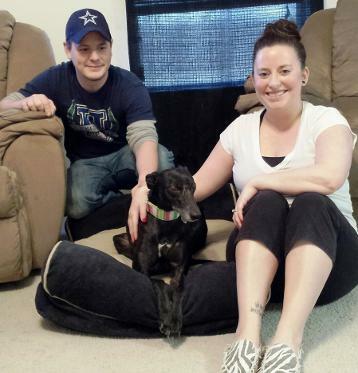 Tiny with her new dad and mom, Brandyn and Katie. Tiny has two new kitty fur-siblings. Congratulations to all! January 17, 2015 update: Tiny has found her forever home! Congrats to all. 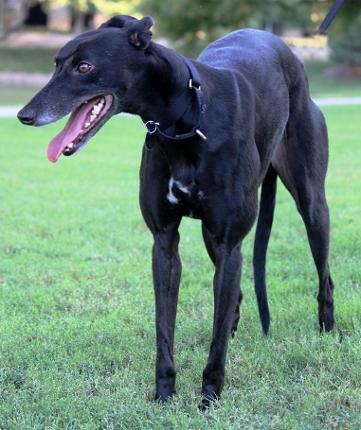 December 5, 2014 Vacation Foster update: Tiny is a big personality wrapped up in a small greyhound frame with the smoothest black coat I’ve ever seen. Now that she’s off injured reserve, she won’t be “on the market” long. If we were looking for a third dog, there’s no question - we would have kept Tiny. She just a sweet, affectionate, funny, fun-loving, really good little girl. Tiny is truly a delight…she came for a week long “vacation” stay at our home over the Thanksgiving holiday. She was just coming off her successful heartworm treatment and had been cleared to play and run, for the first time in several months. Turns out that although she has never raced, she’s a little whirlwind who loves to run, much faster than we thought those little legs could go. She tried so hard to engage our two greys to play in our backyard…but they were having none of it. Didn’t bother her…she roared around joyfully anyway. If you say “No”, though, she comes to an immediate halt. And she’s perfect on leash when you’re walking her. She didn’t get excited if we saw other dogs; she always behaved herself during a walk. One cool thing about Tiny is that she’s such a little bit of a snippet she can get up onto your lap to snuggle… if you’ll let her. None of our other greyhounds has ever been small enough to be a lapdog, although they’ve thought they were! While she’s in your lap, she’ll curl up and snooze while you give her a rub. And she’s totally house-broken so no accidents of any kind. Tiny also loves any kind of toys. She likes to take them out of the toy basket, deposit them somewhere, then go get some more. At any given time, the stuffies were strategically placed all around our house. 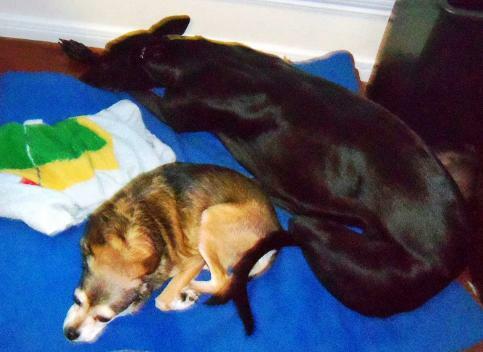 If you’re “in the market” for a greyhound but want a smaller version, Tiny is your girl. Following a round of antibiotics, treatment for heart worms with Immiticide, and an oral dose of Ivermectin, Tiny is ready for adoption, with the understanding that she will be tested for heart worms again in six months. In the event Tiny again tests positive for heart worms in six months, TAGS will treat her with Immiticide again. Tiny is one excited little girl – she could not wait to be released from physical restrictions. Now she can resume normal activities and start looking for her forever home. 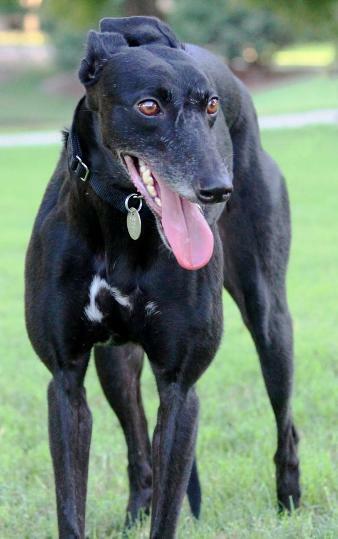 Tiny has been a part of the TAGS's family since September 4, 2014, as a medical reserve Greyhound with heart worms. She completed her 30-day round of antibiotics and completed her two-shot heart worm treatment and three-day hospital stay on October 16, 2014. She is now back in her quiet foster home to rest and wait for the next phase of her treatment in 30 days. Tiny is doing as well as can be expected, considering what she has been through so far. Please consider making a donation to TAGS to help with Tiny’s medical costs (and thanks to those who have donated). She is receiving the very best care, which she deserves. September 4, 2014 update: Tiny has joined the TAGS family to find her lifetime home. But, before she can start her search for her new family she will need to be treated for Heartworms.